“Post That to <Facebook/Twitter>”: Notice the use of the word that. 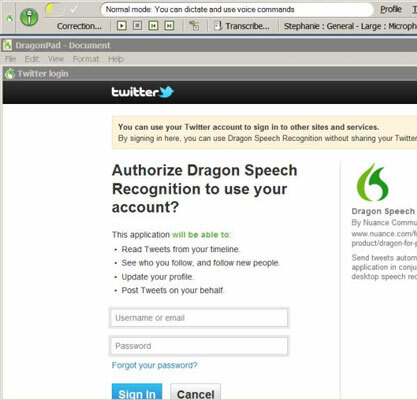 In this version of the command, that refers to text you have already dictated and want to post on Facebook or Twitter. So, when you say this command, the text is in the box when the window opens. “Post to <Facebook/Twitter> <text>”: In this version of the command, the window opens and the text you uttered in the command is placed in the text window. “Post to <Facebook/Twitter>”: Using the command this way opens a blank text window for either Facebook or Twitter and then you dictate text. If one of these preceding commands isn’t recognized, a blank window opens. You’ll have to dictate it again or cut and paste the dictation into the window. 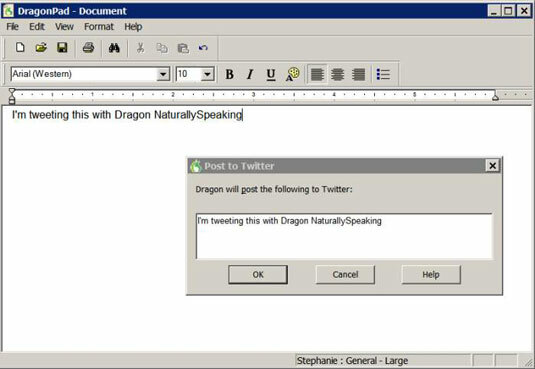 You must give authorization for NaturallySpeaking to post to your Facebook or Twitter account the first time you use this command (as shown in the following instructions). You are, of course, still subject to all the Twitter or Facebook restrictions on your account as you would normally be. A text window with the title “Post to Twitter” will open and your message will be in it. Dictate or type in your e-mail and password. Say, “Click sign in” and your message will be posted.